Why am I writing so soon again? Today I got a news that made me stop for minute and analyze my life… an ex-collegue of my ex-workplace died at 25 years old 😦 in a car accident. What is life? How much do you care about your life or the way you are living it? 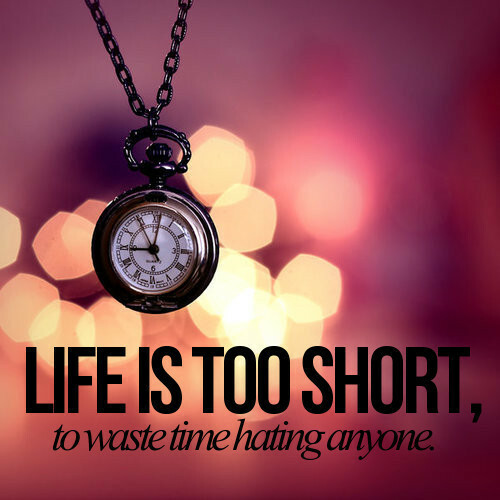 I always knew that life is short..but for others looks like it shorter.. If you die tomorrow, are you proud of the way you live it? Did you did enough? Is peace in your soul? Have you said “I’m sorry” to the one you hurt yesterday? Have you told “I love you” to the one you really love? What about your parents…did you talked to them today? But the most important thing that we forget all the time.. HAVE YOU TALKED TO GOD? Did you stopped for a second and turned to HIM to apologize for all the mistakes you have done in this life until now? I guess not..and if you did it, then you have peace in your soul for sure. I encourage you today to cherish the life you have, you need to change the shift pattern in it, to thank God for every single day that you live and breathe… You still have time to change something, to become a better person, to do something good with your life and change the lives around you. There are many who expect a helping hand … or a good word from you. God knows the exact days of your life, they are in His hands..make sure that when they are over you completed His Plan for your life..because be sure He has a wonderful plan for your life. Remember you are very precious in God’s eye. He loves you a lot and His love has no limites. I am waiting for you opinions.. Psalm 89:47 says : Remember how short my life is, how empty and futile this human existence! But look what God is telling us: Proverbs 3:1-2 My son, don’t forget my teaching,but let your heart keep my commands;for they will bring you many days, a full life, and well-being. Isaiah 43:3 Since you are precious and honored in my sight, and because I love you, I will give people in exchange for you, nations in exchange for your life.